Professionally Installed by Panhandle Home Solutions! I have some basic purchase considerations. I work 5 days a week and can't get more than a couple of days off to have my new floor installed. Can we work around my scheduling problems? Good news, Amazing Garages' average floor installation time is one day, versus 4 - 5 days with other companies and products. I'd like to have an Amazing Garage surface applied in my company warehouse this week but the temperatures have been over 90 degrees. Will I have to wait until it cools down? No, our surfaces can be applied in extreme hot and cold temperature conditions, so there's no need to wait if you want it installed right away. My family and pets spend a lot of time in the garage and laundry room areas where our floor will be installed. Will it be safe to breathe after the installation of the new floor surface, or will it smell bad? 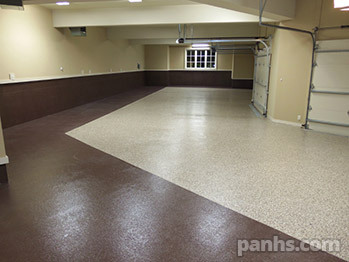 Your new Amazing Garage coating has a low VOC chemistry, so is safe for you, your pets and the environment, but is also extremely durable because it's poly-aspartic based as opposed to polyurethane epoxies. Low VOCs also mean low odor that dissipates in a few hours. We are considering installing a new garage floor using a finishing kit from our local hardware store. How do I know the results we'll get with Amazing Garage flooring are any better than applying our own floor surface? Amazing Garage provides superior finish and durability over off-the-shelf commercial epoxies, which is why we're able to offer a limited lifetime cement floor coating warranty on both products and labor. Cheaper products are diluted so that consumers can apply them without mistakes ruining the application. As a result, the surfaces don't last long and have to be applied repeatedly. Do-it-yourself kits include a small bag of color chips that won't provide full coverage, resulting in a disappointing inconsistency in patterns. Our new home has a patio with extreme damage, including deep cracks and buckling. Can you help me get it in order for an Amazing Garage application, or will we have to replace it first? Amazing Garage installation teams are highly trained in preparation processes and are typically able to complete the repairs necessary to correctly apply your new surface. Often, damaged areas can be leveled and filled without replacement of the concrete, but you'll want to contact our flooring experts to have the area evaluated prior to scheduling your installation. I plan to resurface my garage soon to use as a part-time game room and I'd like to do it in specific colors and possibly add a logo. Can I pick the colors I want and order them in the combination I choose? 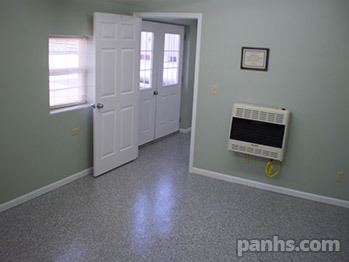 Yes, we offer over 200 standard floor color selections and a wide variety of pre-mixed patterns to choose from. Plus you can choose unlimited custom floor colors and chip mixes, and we'll install logos and custom floor designs. Other products offer only 12 - 24 colors. Additionally, only Amazing Garage offers chips sizes of 1/2", 1/4", 1/16" and 1/32" inch offering a virtually limitless variety of colors and textures. Exactly how durable is it? The floor in my shop takes a beating from heavy equipment. I don't want to invest in a new surface if it will just be torn up in a few weeks. Can your surfaces handle an industrial beating? Amazing Garage surfaces are prepared with a base coat that chemically bonds to the surface and is rated at 400 psi - concrete is typically around 350 psi - so the concrete will literally tear apart before the product comes off. My husband and I store several motorcycles in our garage and we have damage to our old floor where the tires have peeled off paint. Will I have to use protective mats with your product? No mats required! Hot tires chemically bond to other products, and when a vehicle is moved it peels the coating off. Tires won't stick to Amazing Garage flooring, or cause it to peel. It's also resistant to abrasion, whereas other products are softer and scratch easily. I rebuild boats in my garage and need a floor that can tolerate lots of spillage of the cleaners and oils I use. Will these chemicals soak into your finishes? No, our surfaces are solvent, chemical and oil resistant, which includes all common solvents and household cleaners. If you have a question about a specific solvent, give us a call. All Amazing Garage products are also UV resistant and virtually unaffected by UV so they won't yellow like other products. Do you offer non-slip surfaces? We include an anti-slip additive in all applications to minimize the possibility of slipping. Textures can be adjusted to meet safety requirements. Textures will also vary slightly based upon whether 1/2? 1/4?, 1/16? or 1/32? chips are used. I'm excited about having my new Amazing Garage coating installed next week, but with the heavy traffic it's going to get, I'm worried we're going to damage it. Will you do the repairs if we manage to do some kind of damage? Yes, but remember, our finishes are tough enough for commercial and industrial use. If any damage does occur, we will repair the affected area, or entire floor if required, within the warranty period. We've just bought a floral shop with a floor that needs to be replaced right away. The new floor will have to be able to survive daily drips, drops, mud hosing, fertilizers etc. and still look sophisticated for our customers. 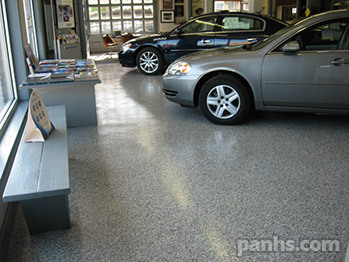 Our floor coatings are the perfect solution for your business. Small spills are easily cleaned up with household cleaners and a damp mop, and you can hose it off when necessary. We coat the foundation walls around the edges of the room and provide a cove base which allows easy cleaning. The result is a tough-wearing, great looking floor, that's easy to maintain. I'd like to recommend your product to a friend who has a restaurant. Would your floors be appropriate for a kitchen or freezer? Yes, our floors are approved for use in food processing areas. Our preparation process seals concrete surfaces to prevent microbial contamination, and we use a sanitary, no seam process which prevents microorganism growth. The non-slip aspects of our floors are also important in preventing accidental slips and falls due to fluids spills, and make clean up easy for staff.